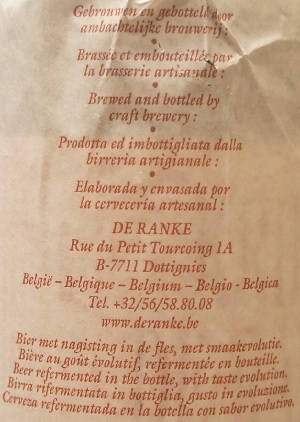 Brewer Description: (from bottle) Dry hop Mosaic Sour Ale. Intro: A 330ml bottle with a best before date of 7th March 2022. Poured into a 3 Fonteinen stemmed glass. Appearance: A clear golden orange colour with a two finger white head that had pretty good retention and left some lacing. 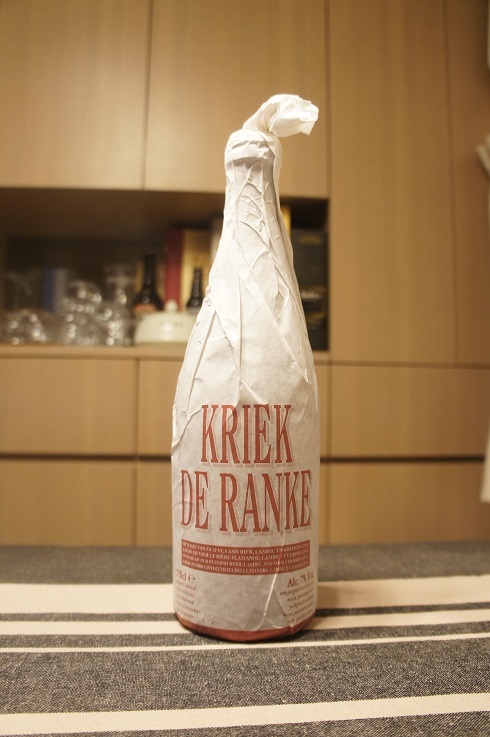 Aroma: Tart, sour, passionfruit, unripe mango, berries, grapefruit zest, grape, grass, funk and oak. 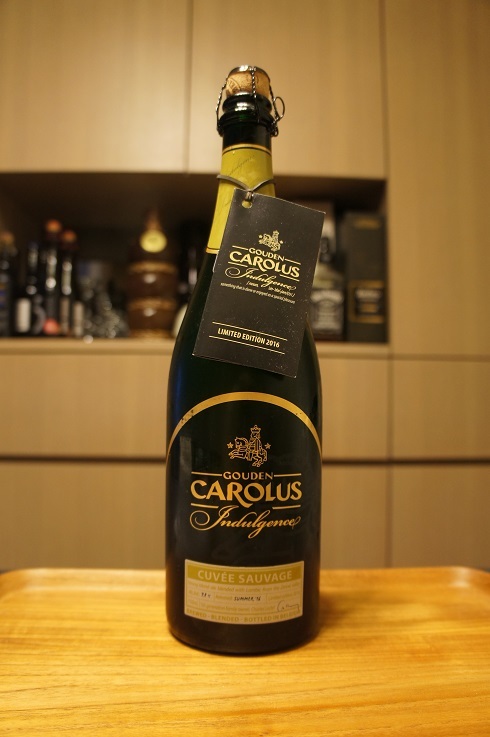 Taste: Tart, sour, passionfruit, berries, lemon juice, citrus zest, grass and lightly funky and herbal. Mouthfeel: Acidic, slightly astringent, medium to light bodied with moderate carbonation. 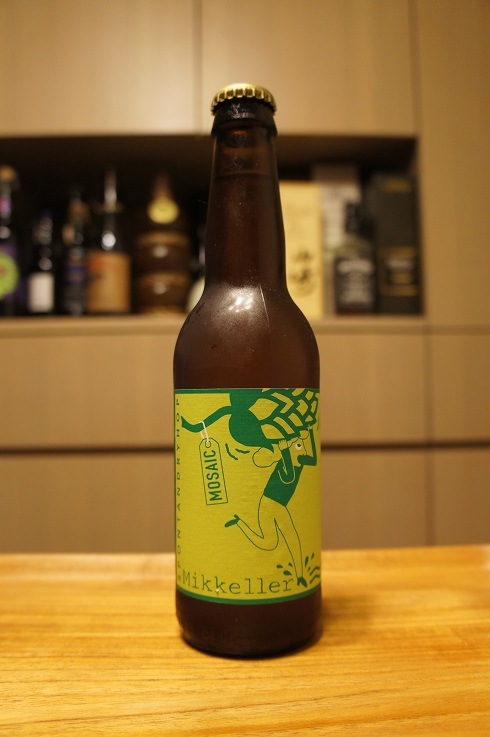 Overall: The Mosaic hop flavours come through nicely and was enjoyable. 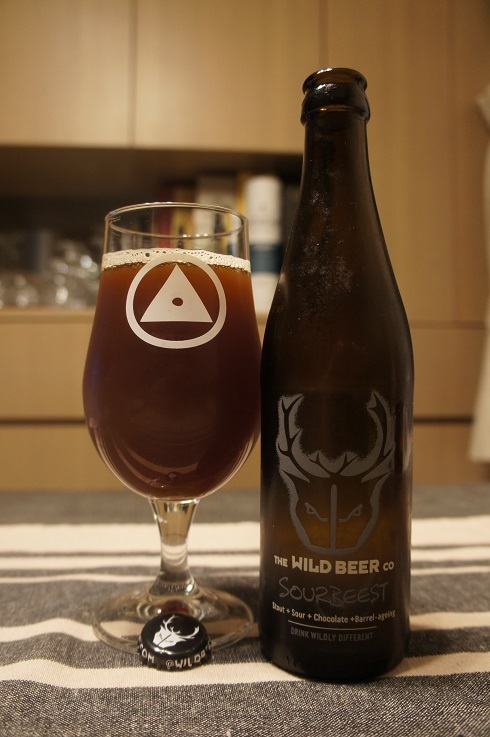 3 - Indifferent (buy if no other choice), Beer Reviews, England, Euro Sour Ale, The Wild Beer Co. 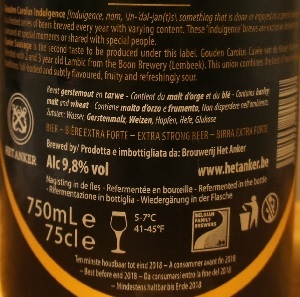 Brewer Description: (from bottle) We believe exceptional brewing stems from imagination and passion. It’s not just a process. 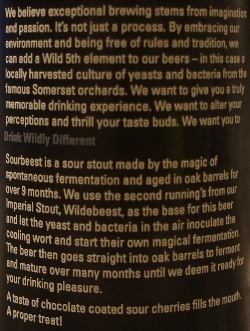 By embracing our environment and being free of rules and tradition, we can add a Wild 5th element to our beers – in this case a locally harvested culture of yeasts and bacteria from the famous Somerset orchards. We want to give you a truly memorable drinking experience. We want to alter your perceptions and thrill your taste buds. We want you to Drink Wildly Different. 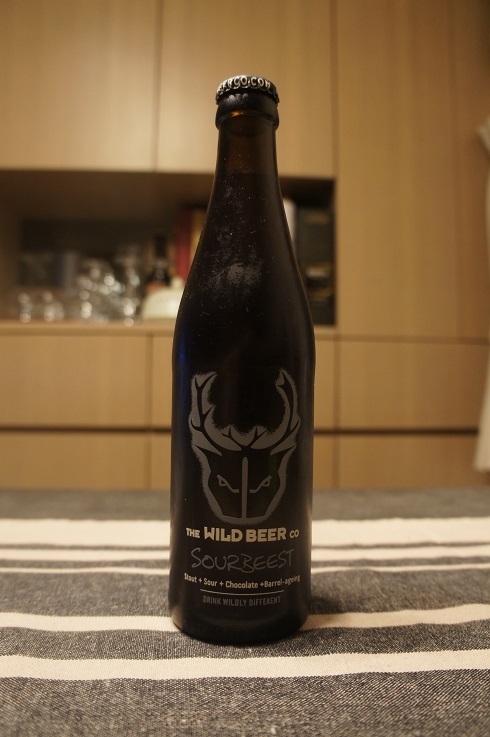 Sourbeest is a sour stout made by the magic of spontaneous fermentation and aged in oak barrels for over 9 months. We use the second running’s from our Imperial Stout, Wildebeest, as the base for this beer and let the yeast and bacteria in the air inoculate the cooling wort and start their own magical fermentation. The beer then goes straight into oak barrels to ferment and mature over many months until we deem it ready for your drinking pleasure. A taste of chocolate coated sour cherries fills the mouth. A proper treat! Intro: A 330ml bottle with a best before date of 14th January 2018. Poured into a Holy Mountain tulip glass. Appearance: A moderately dark brownish red colour with pretty much no head, with any head that was there, dissipating almost immediately, while leaving only sparse to no lacing. 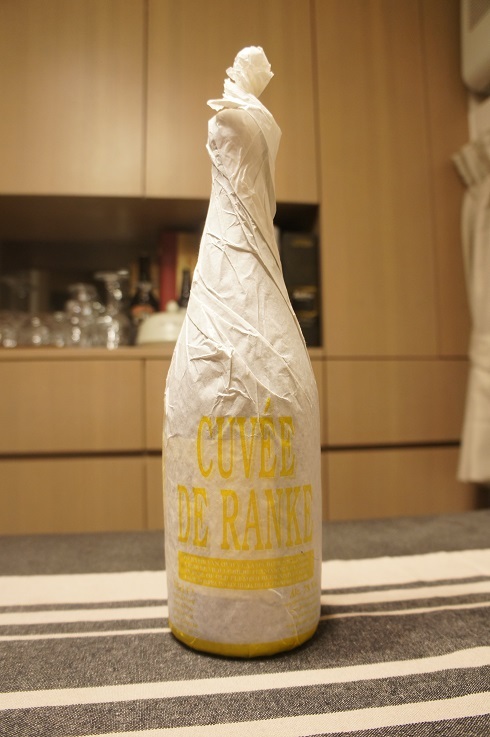 Aroma: Tart and sour mixed berries, vinous red wine, cherry, oak with hints of chocolate in the background. Taste: Milk chocolate, lightly tart, cherry, mixed berries, vinous, grape with perhaps some light oak. 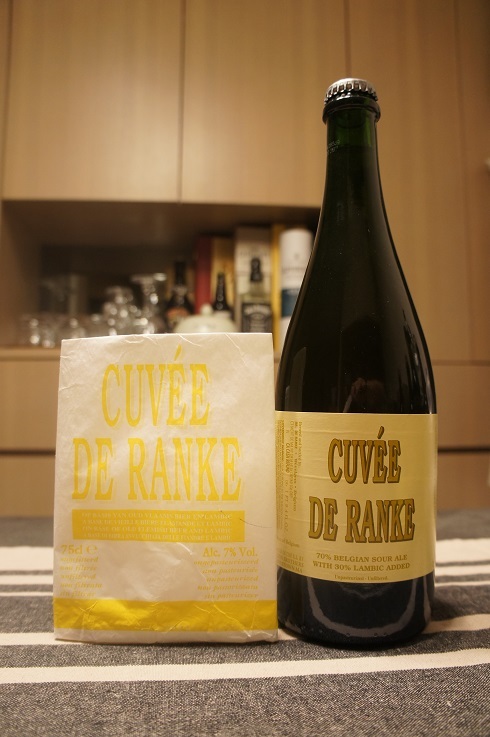 Overall: The tart and sour part was actually pretty good. However, the chocolate came through in the taste every now and then, and while it wasn’t overpowering, I didn’t think it combined too well with the sour parts. 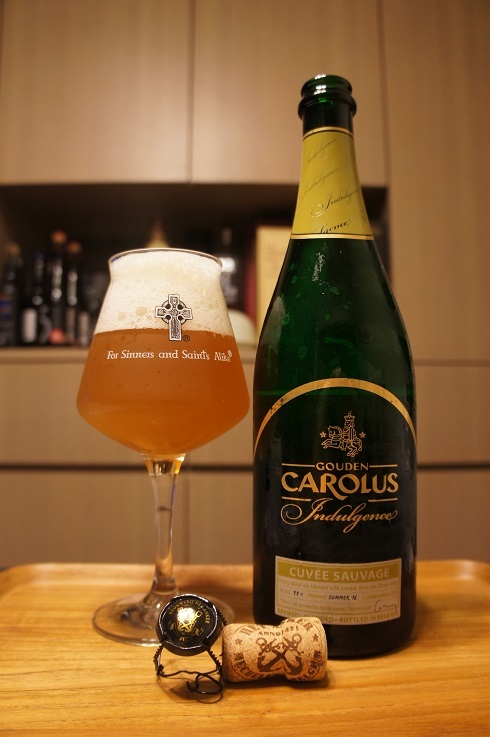 I also felt that the carbonation was too light.